I hope all of you have been enjoying this series of posts so far! We’ve so far covered the varieties: Kuala Kayan#1, Kayu Lapis, and Kudakan (refer to my older posts for the write up on these). This is part 3 of my Bucephelandra series of posts, and today we will be covering Buceph. 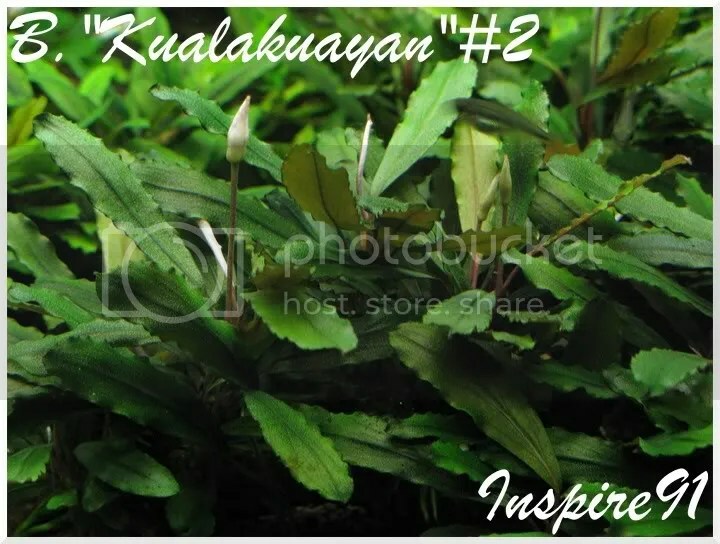 “Kualakuayan”#2. As with many other Bucephelandra this variety can be grown on either wood/rock or planted in the soil. It is relatively easy to grow, but slow and I mean that in terms of Bucephelandra “slow”. It is easy to grow, but slow, it prefers soft (2-3 degrees) and acidic (6pH) water. It can easily be grown in a terrarium setting, as that is how it is found growing in the wild. 1. The leaves get to a max length of about 2in. and ½ in. wide. 2. The leaves aren’t very long and slender, this particular variety has short “stubby” leaves, and the tip is blunt and rounded. 3. There is very slight ribbing/ruffling around the edge of the leaves, it is not as drastically ribbed like particular other varieties. 4. Although the shade of color can vary slightly, predominately this variety has a medium shade of green for the older leaves, and the newer leaves are light green. 5. 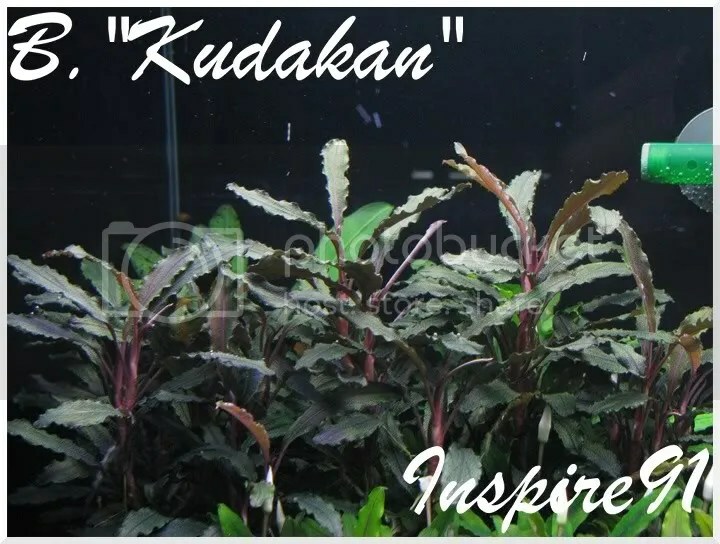 This variety grows loosely (definitely not as tight as “Kuala Kayan”#1) and it grows in a vertical direction. 6. 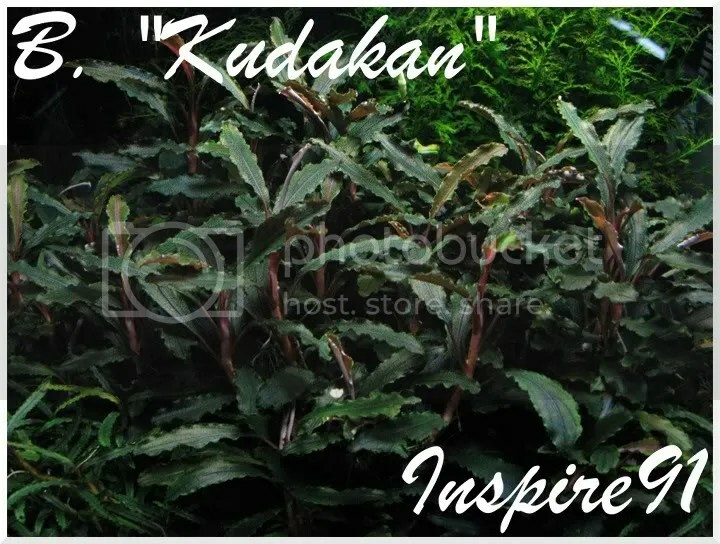 As small a detail as this may be, you’ll notice that the leaves of this variety lay flat (parallel with the ground) as opposed to “Kualakuayan”#1 where it’s leaves point upward. 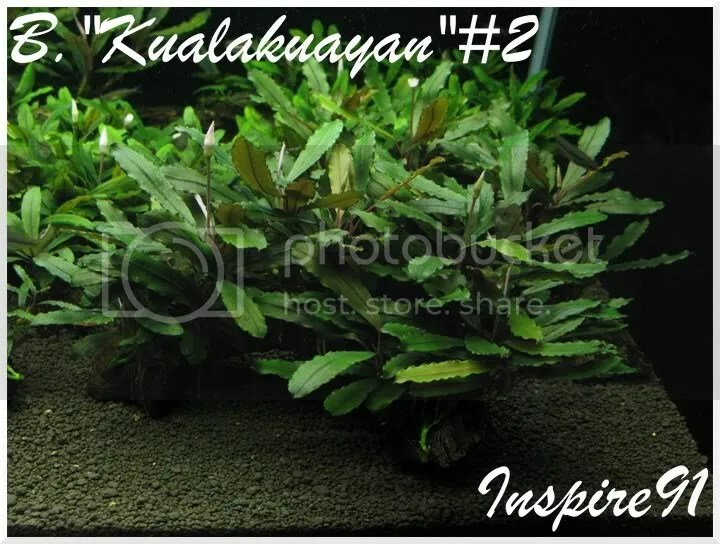 It was named “Kualakuayan” because it was found near that town, it is a small town in Borneo’s Kalimantan Tengah region. I hope you enjoyed this 4th installment of my Bucephelandra series! Keep checking back for the 5th installment of this series. I can tell you folks now that it will either be on Buceph. “Brown” from West Kalimantan, or Buceph. “Sintang”. Please leave a comment if you like what you are reading/seeing, it would be much appreciated! I hope all of you have been enjoying this series of posts so far! We’ve so far covered the varieties: Kuala Kayan#1 and Kayu Lapis (refer to my older posts for the write up on these). This is part 3 of my Bucephelandra series of posts, and today we will be covering by far one of the more colorful of its genus, Buceph. 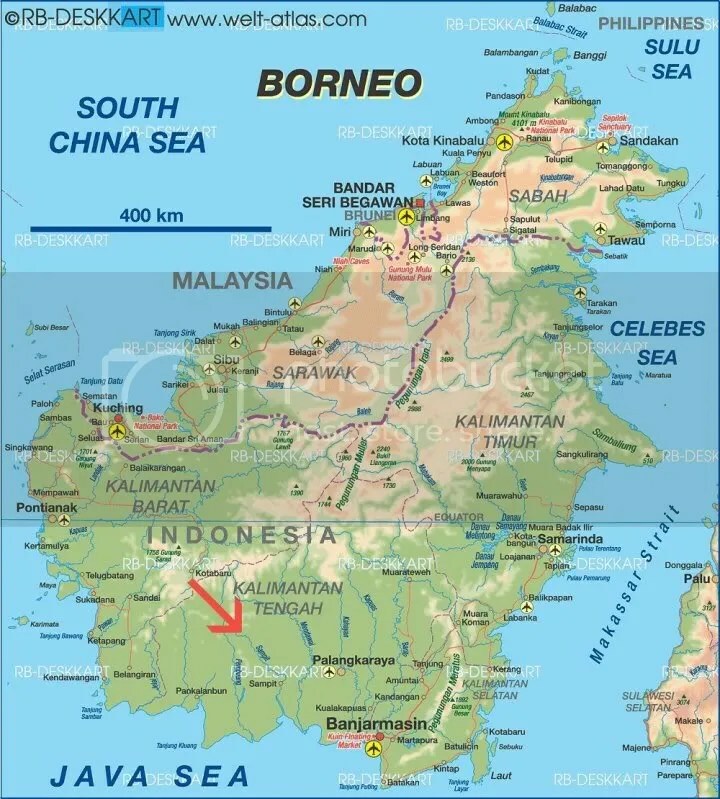 “Kedagang”. As with many other Bucephelandra this variety can be grown on either wood/rock or planted in the soil. It is relatively easy to grow, but slow, and I mean that in terms of Bucephelandra “slow”. Here is a quick gauge of growth speed in terms of Bucephelandra, B. “Kayu Lapis” is slow, and B. “Brown” (from West Kalimantan, this is the most common variety in the hobby at the moment) is fast. Prefers soft (2-3 degrees) and acidic (6-7pH) water. This along with others of its genus can easily be grown in a terrarium setting, as this is how it is typically found growing in the wild. 1. The leaves get to a max length of about 3in. and 1/2 to 3/4in. wide. 3. The most unique characteristic is it’s color, it has a dark green base leaf color with a very attractive shiny “sheen” of blue over it. 4. The stem of this variety is quite reddish in hue (more so than other varieties I have seen), making for a nice contrast to the blue and green of the leaves. 5. This variety grows loosely and vertically, it also does not creep/send runners in a horizontal fashion. At the moment I am currently still looking for the specific origin of this variety, but one can infer that it comes from a place/town called “Kedgagang”. If I get any updates or find it’s specific whereabouts, I will edit this post.